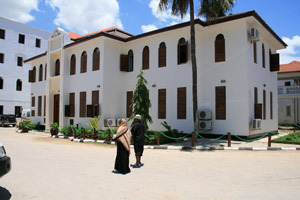 Mnazi Mmoja Hospital (MMH), (literally “One Coconut Hospital”), is located on the picturesque coast of Zanzibar in the capital city of Stone Town. It is a government-run hospital serving the population of Zanzibar, which presently stands at approximately 1 million people. The hospital contains 400 beds and consists of a variety of specialty departments, including pediatrics, surgery, internal medicine, acupuncture, physiotherapy, occupational therapy, trauma and maternity. The hospital is fairly well-staffed with doctors, nurses, mid-wives, nursing students and a number of foreign medical students. Stone Town was recently and deservedly declared a World Heritage Site by UNESCO. Once considered to be one of the world’s most important trading ports, exporting Zanzibar’s famed cloves around the globe, Stone Town still maintains it old world appeal. Cross-hatched by winding alleys, bustling bazaars, mosques and grand Arab houses whose original owners vied with each other over the extravagance of their dwellings, Stone Town is a city of beauty unlike any other. The Acupuncture Ward of Mnazi Mmoja Hospital is open 5 days a week and accommodates approximately 20-30 patients per day. Standing only metres away from the turquoise waters of the Indian Ocean, the Ward is directed by a local doctor who was trained in China, and staffed with 2 Chinese physicians and 3 to 4 nurses. PRC acupuncture students and acupuncture alumni are eligible to do both short and long clinical rotations in the Acupuncture Ward any time of year. Clinicians can expect to gain a great deal of experience in needling, cupping and electrical stimulation while treating conditions such as facial paralysis, malaria, filaria, HIV/AIDS, asthma, skin conditions, stroke and many more. Eligible PRC students must have completed the following prerequisites: a minimum of 200 hours clinical practice, OM201/202 TCM Diagnosis, and ACU113/114 Techniques and Therapeutics. This opportunity is not available to non-PRC students. Placement opportunities in the Acupuncture Ward of Mnazi Mmoja Hospital are year round. No minimum stay is required. Please contact our Office of Admissions for more information and an application.